Britain and France are urging the UN Security Council to restart the Israeli-Palestinian peace process, while New Zealand has begun drafting a resolution on the issue. This was prompted by the US saying it may “reassess” its position on the stalled talks. “We have been working on a text that might serve the purpose of getting negotiations started,” said New Zealand’s UN Ambassador Jim McLay, adding that the country is ready to wait and see how the French initiative for a resolution will turn out. France announced last month that it wanted to begin talks about drafting “parameters” for ending the conflict in the Middle East, with the hopes of bringing the US onboard, which has repeatedly sided with Israel in the past. 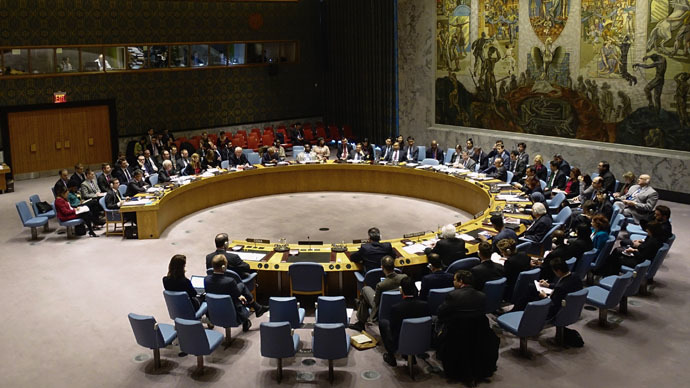 “It’s the responsibility of this council to adopt a consensual and balanced resolution that sets the parameters of a final status and a timeline for the negotiations,” French UN Ambassador Francois Delattre said at a Security Council meeting. The timing of the initiative is due to the US stating that it might “reassess” its Middle Eastern policies after Israeli Prime Minister Benjamin Netanyahu publicly said he was against Palestinian statehood during elections last month. The Palestinians are seeking an independent state in Gaza, the West Bank and East Jerusalem. They also want to reclaim sovereignty of the lands captured by Israel in 1967. The UK has expressed support for “setting out the parameters for a peaceful and negotiated solution,” according to Britain's UN Ambassador Mark Lyall Grant. “But this will require proper consultation to achieve the full backing of the council,” he added. The US voted “No” to a Palestinian-drafted resolution in December, which called for the withdrawal of Israeli troops from the occupied West Bank and East Jerusalem and the establishment of the Palestinian state by the end of 2017. Even though the timing of these calls have been praised due to possible American diplomacy shift, a new Washington Post-ABC News poll released at the end of March showed American support for a two-state solution in the Middle East is at a 20-year low. Israeli and American representatives also ended up missing the UN Human Rights Council session on the Palestinian territories on Monday, which was dedicated to looking at the Gaza conflict that killed 2,200 people in 50 days in 2014. Meanwhile, Germany and Iraq called on UN member-states on Tuesday to increase the protection of Iraqi cultural sites, which jihadist groups are threatening to destroy. The two countries are scheduled to present their draft resolution that calls on all perpetrators to be prosecuted and encourage countries to step up the monitoring of stolen goods to prevent the illegal trade. “Iraq is a cradle of our common civilization. We cannot leave it to face this challenge alone,” Germany’s deputy ambassador Heiko Thomas told the General Assembly. “The international community must do all it can to put an end to these war crimes,” he said. The level of destruction of Iraq’s artifacts has shocked the international community, after several videos came to light showing Islamic State members destroying historical items at the Mosul museum and in the ancient cities of Hatra and Nimrud. A vote on the resolution is expected to take place in May.